Why even bother changing this habit? What’s the harm in too many “I’m sorry”s? Start listening to those around you and check in about how other people’s “I’m sorry” makes you feel. It makes me feel like you’re weak. One incredibly powerful way to get more of what you want in your life is to get clear about what you want and then ask for it. Clearly, simply, without too much fuss or too many words. Take the time to notice how often you say “I’m sorry” today. Comment below and tell me what you say “sorry” for! I was surprised at myself, too. Sometimes you say “sorry” too often because you don’t believe you deserve more. 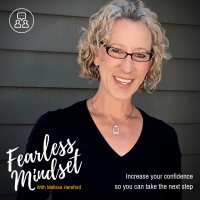 You can overcome that belief in my class Fearless Mindset: Increase your confidence so you can take the next step.